The A9 Highway is a 321-kilometer-long (199 mi)  highway in Sri Lanka, which connects the central city of Kandy with Jaffna, a city on the northern tip of the island. The A9 highway north-bound begins at Kandy, in the central hills. The highway begins at the heart of the city, next to the Kandy Lake. Within Kandy, it meets the A1, A10, and A26 highways. The A 1 road is an A-Grade trunk road in Sri Lanka. It connects the capital city of Colombo with Kandy. The A 10 road is an A-Grade trunk road in Sri Lanka. 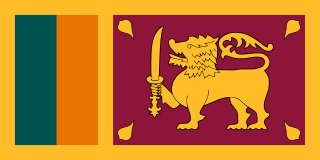 It connects the Katugastota with Puttalam. The A 26 road is an A-Grade trunk road in Sri Lanka. It connects Kandy with Padiyathalawa. It moves north through the hills to Matale. It passes Dombawela and Naula, before reaching Dambulla. At Dambulla, the A9 crosses the A6 highway. The A6 provides connection to Sigiriya, Habarana, and Trincomalee. Traffic between Jaffna and Colombo transfer between the A6 and A9 highways at this point. Matale often written as Mathale, is the largest town of Matale District of the Central Province, of Sri Lanka. It is 142 kilometres (88 mi) from Colombo and near Kandy. Surrounding the town are the Knuckles Mountain Range, the foothills were called Wiltshire by the British. It is a mainly agricultural area, where tea, rubber, vegetable and spice cultivation dominate. Dambulla is a town, situated in the Matale, Central Province of Sri Lanka, situated 148 km (92 mi) north-east of Colombo and 72 km (45 mi) north of Kandy. Due to its location at a major junction, it is the centre of vegetable distribution in the country. The A 6 road is an A-Grade trunk road in Sri Lanka. It connects Ambepussa with Trincomallee. The A9 passes Kekirawa and Maradankadawala, before reaching the Anuradhapura-area. The A13 highway at Galkulama and the A20 highway provide access to Anuradhapura. The A9 meets the A12 highway at Mihintale. The town of Medawachchiya provides connection to Mannar and the historic ferry to India, via the A14 highway. Passing Iratperiyakulam, the A9 reaches the city of Vavuniya. The highway runs through the heart of the city. At Vavuniya, the A29 and A30 highways run to the east and west of the A9. The A 13 road is an A-Grade trunk road in Sri Lanka. It connects the Galkulama with Anuradhapura. The A 20 road is an A-Grade trunk road in Sri Lanka. It connects Anuradhapura with Rambewa. Passing Omanthai, Puliyankulam, Mankulam, and Murikandy, the A9 meets the A34, before reaching Kilinochchi. After passing the A35 highway, it crosses Elephant Pass, into the Jaffna Peninsula. The highway goes past Mirusuvil and Chavakachcheri on its final run up to Jaffna, the cultural centre of the north. In Jaffna, it meets many other roads, including the A32 highway. The A9 passes through the city centre and terminates at the Jaffna Fort. Omanthai is a little town in North Sri Lankan district of Vavuniya. The last Sri Lankan army check point which divided the Government and LTTE controlled areas used to be in Omanthai for many years. Puliyankulam is a town in Vavuniya District, Sri Lanka. A road going through this town connects Mankulam to Vavuniya. Another road going through Puliyankulam connects Nedunkeni, Oddusuddan and Mullaitivu to Vavuniya. The A 34 road is an A-Grade trunk road in Sri Lanka. It connects Mankulam with Mullaitivu. Due to the civil war in the north of the country between the Sri Lankan armed forces and Tamil Tiger rebels, the highway was closed in 1984. Since then, parts of the highway were at times under the control of the LTTE. After the cessation of hostilities between the two sides in 2001, the highway was ceremoniously reopened up to Kilinochchi with certain restrictions on February 15, 2002. During the time, around 20% of the highway ran through the LTTE controlled areas. Asian Highway 43 (AH43) is a route of the Asian Highway Network, running 3,024 kilometres (1,879 mi) from Asian Highway 1 in Agra, India to Matara in Sri Lanka. Yal Devi is a major express train in Sri Lanka. Operated by Sri Lanka Railways, the Yal Devi connects Colombo, the nation's commercial hub, with the northern cities of Jaffna and Kankesanturai. From 1990 up to 2015, the service had to terminate at intermediate stations, due to the Sri Lankan civil war. The Northern Line was rebuilt and returned to Jaffna Railway Station by October 2014 and Kankesanturai by January 2015. Jaffna railway station is a railway station in the city of Jaffna in northern Sri Lanka. Owned by Sri Lanka Railways, the state-owned railway operator, the station is one of the busiest in the country, linking the north with the capital Colombo. The northern line is a railway line in Sri Lanka. Branching off the Main Line at Polgahawela Junction the line heads north through North Western, North Central and Northern provinces before terminating at the northern port of Kankesanthurai. The line is 339 kilometres (211 mi) long and has 55 stations between Polgahawela Junction and Vavuniya. It is the longest railway line in Sri Lanka. The line opened in 1894. 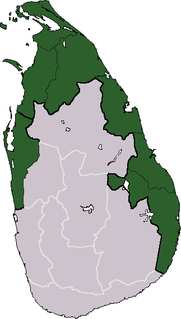 Major cities served by the line include Kurunegala, Anuradhapura, Vavuniya and Jaffna. The popular Yal Devi service operates on the line. The line was severely affected by the civil war and no services operated north of Vavuniya after 1990. Reconstruction of this section of the line commenced following the end of the civil war in 2009 and was fully completed in early 2015. Yakkala is a township located on Colombo-Kandy Highway (A1), 30 km away from Colombo, Sri Lanka. It forms part of Gampaha Municipal Council and belongs to Gampaha District, Western Province. Its elevation is 30m above MSL. Distances from Yakkala to main cities are; 30 km to Colombo(A1), 86 km to Kandy(A1), 4.5 km to Gampaha(A33) and 13 km to Radawana(B479). Chunnakam Power Station was a thermal power station in Chunnakam in northern Sri Lanka. Commissioned in 1958, the station is owned and operated by the state-owned Ceylon Electricity Board (CEB). It was decommissioned in 2013, and replaced by the Uthuru Janani Power Station, which is constructed less than 100m south of the Chunnakam Power Station. ↑ "Smooth sailing on A9 highway". The Daily News. 2002-02-16. Archived from the original on 2011-01-20. Retrieved 2009-03-02. 1 2 "A-9 opens". The Daily News. 2009-03-03. Archived from the original on 2009-03-06. Retrieved 2009-03-02.